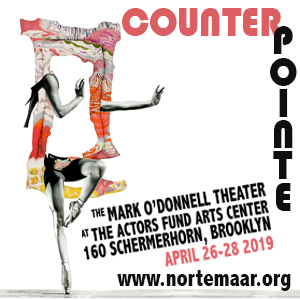 Contributed by guest correspondent Sharon Louden / As this is my last post for Two Coats of Paint, I’ll go out with a bang — a lot of painting from various places! 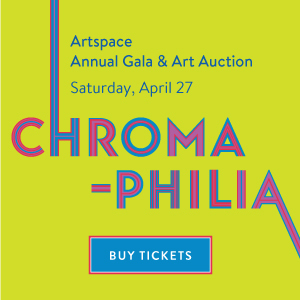 One of my assignments was to attend Satellite “the alternative exhibition featuring 50+ art organizations.” With so many things to see, I was only able to attend one of the five sites — the Ocean Terrace Hotel on Miami Beach. Strolling through Satellite reminded me of the “Gramercy International Art Fair” (which is now the Armory Art Show) in the mid-nighties: curated exhibitions hung in little hotel rooms. 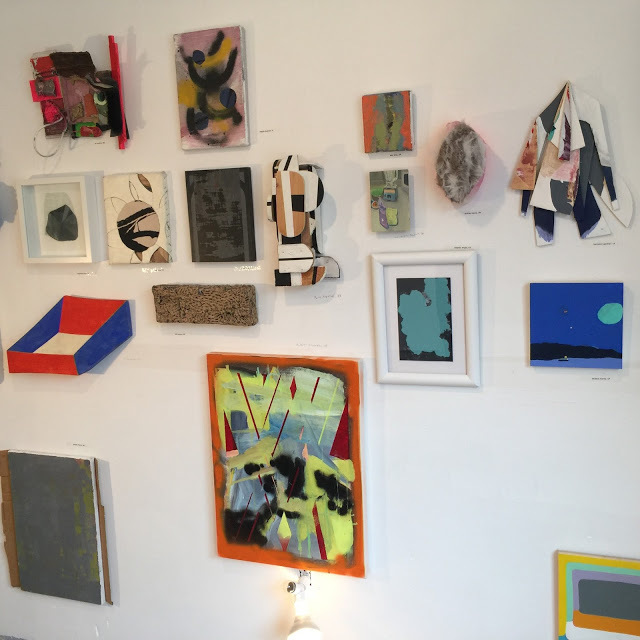 However, the hotel here–deteriorated, ready for demolition–was in far worse shape than the Gramercy Park Hotel, but artists are inventive, and they found wonderful ways to display their work. 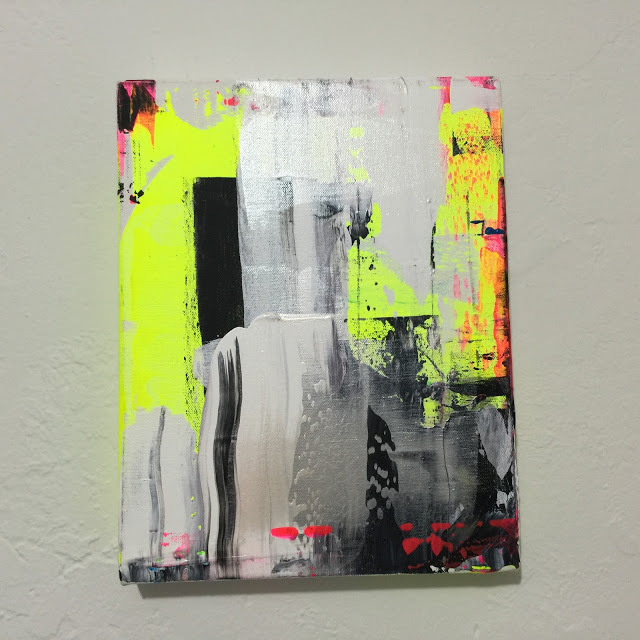 Curated by Julie Torres, “Art in America: Artists working in 50 states + Puerto Rico,” according to the press release, “featured a constellation of artwork from across the US featuring one small work per artist.” Julie put out a call for participation on Facebook and selected an artist from each state. Here are a few of the highlights. 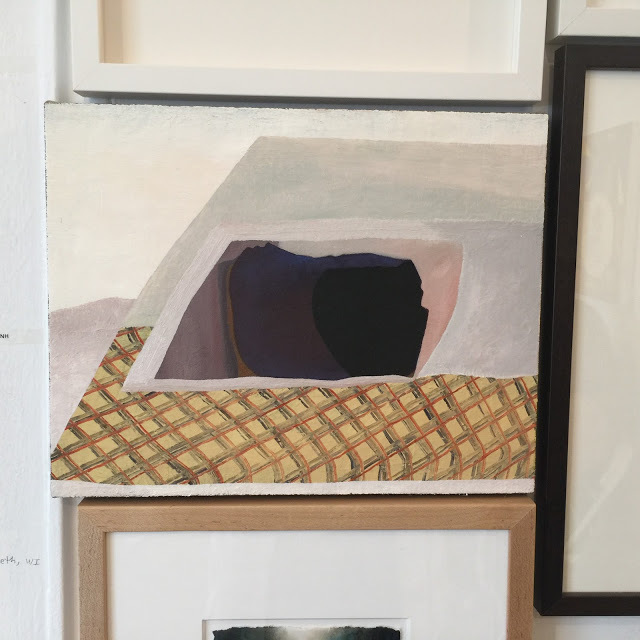 I had to move on to other curated rooms, so I can’t include more of the small-scale work that was on view, but Julie Torres has made a checklist of the wonderful show available online. 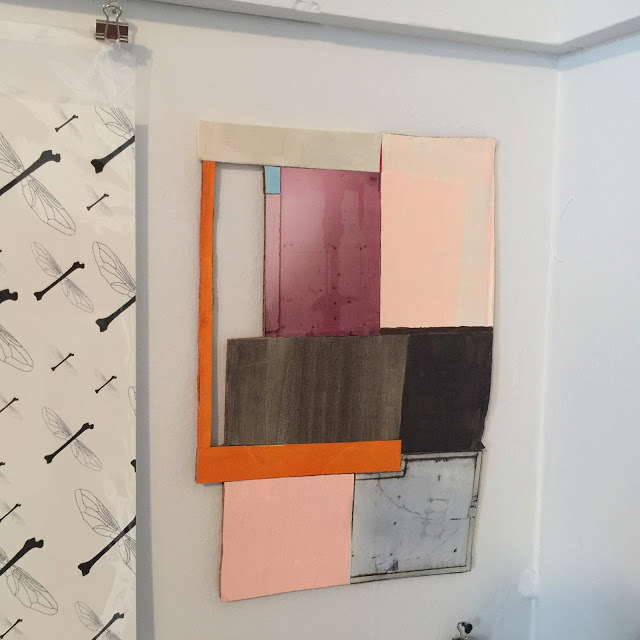 This is an installation view of one wall. 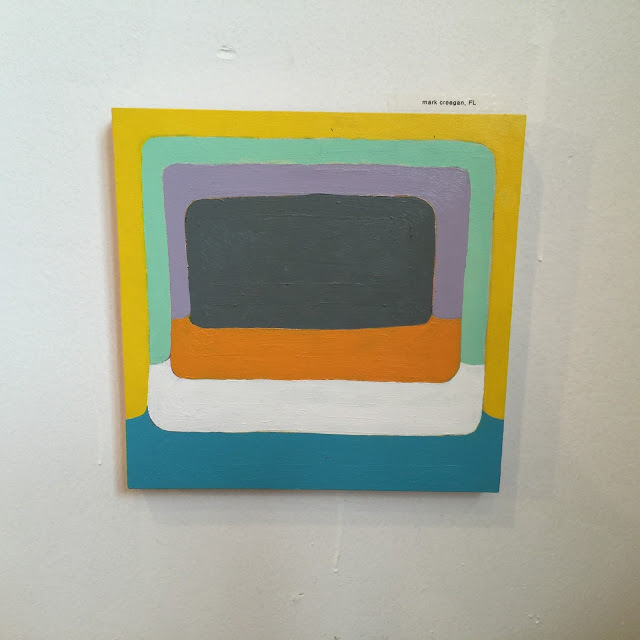 On to another room, where I found Martin Durazo, who had a piece called Un, 2013, acrylic on canvas, at Jausart. Then I came to Ky Anderson‘s lovely display, which was part of the curated exhibition for her organization, DUSK Series and Editions. 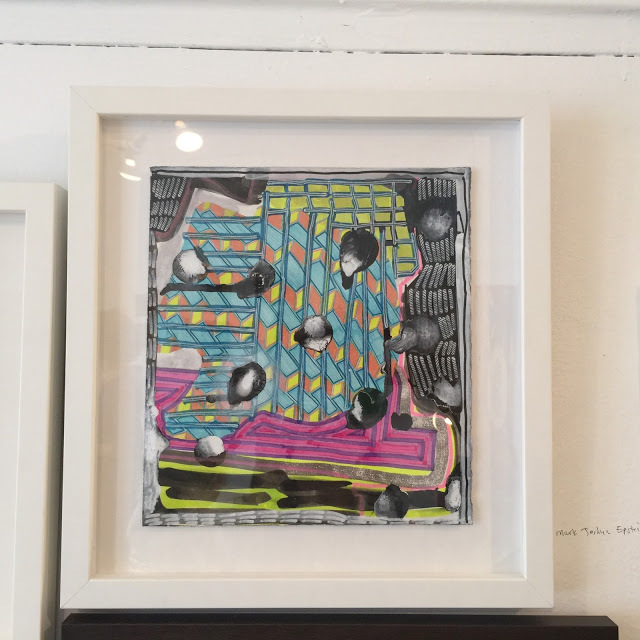 I was impressed with both her work and the context she had created in the small space. 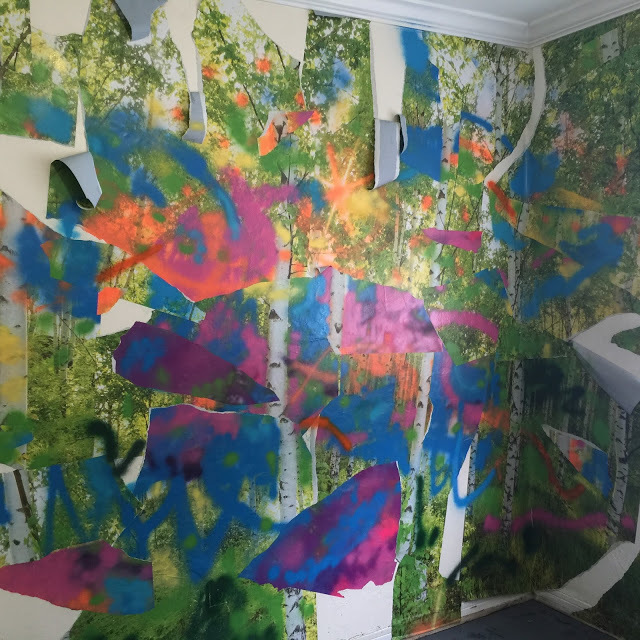 She painted the walls to create a kind of “camouflage” for her works on paper. 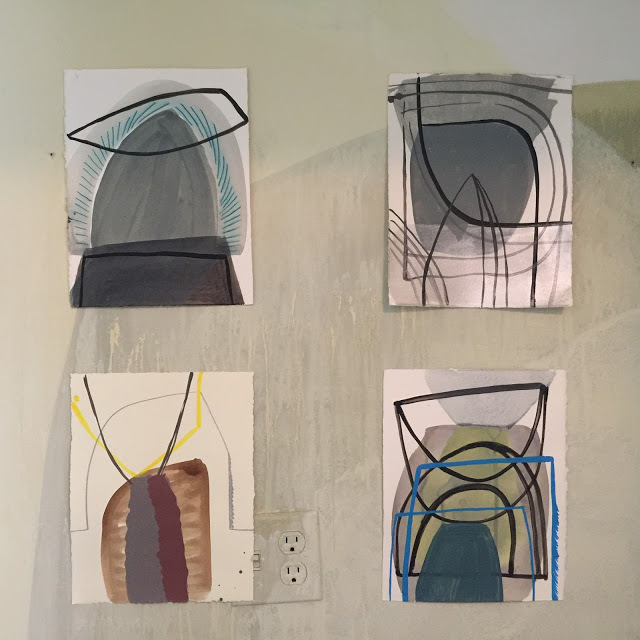 Ky Anderson, 4 pieces from Small Series, 2015, acrylic & ink on paper, 12×9 1/5 inches. 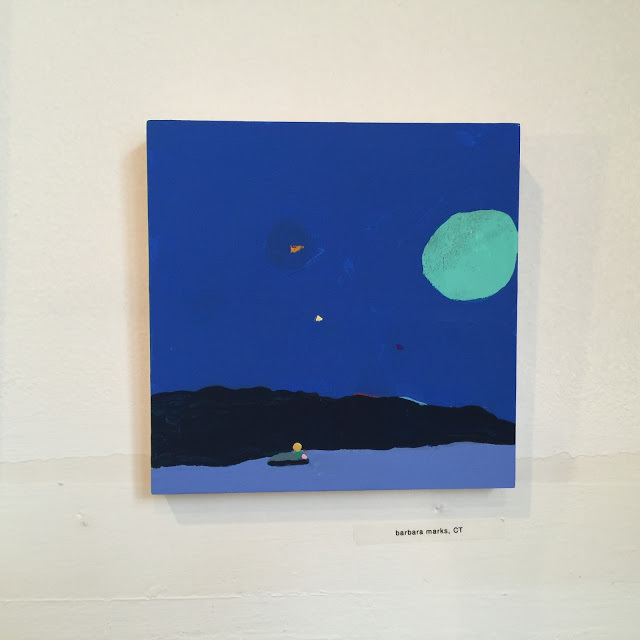 At c2c project space, I found a few interesting pieces. Tamara Zahaykevich, Sylvan, 2014, Polystyrene foam, paper, acrylic paint, 3.75 x 3.5 x .75 inches. 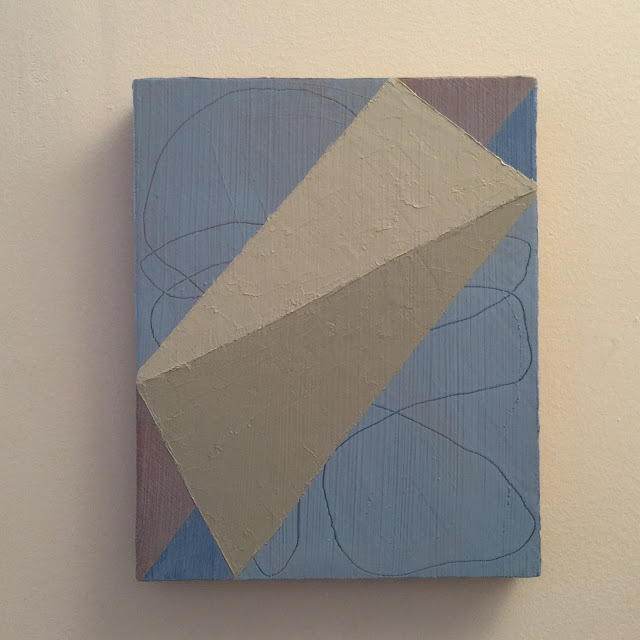 Matthew Neil Gehring, Wedge, 2015, oil on linen over panel, 11 x 9 inches. Also of note: a lovely dialogue between Gary Petersen and Seth Koen. 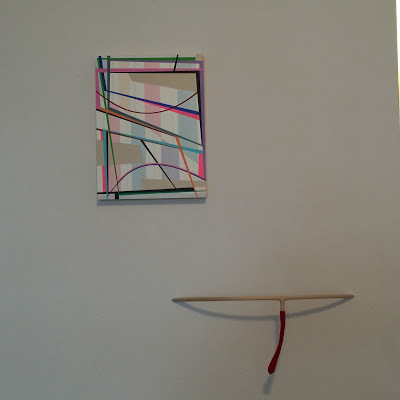 Gary Petersen, Near Miss, 2015, acrylic on wood panel, 12×9 inches, and Seth Koen, Help Me Somebody, 2015, wood, thread, metal chain, 12.5h x 5.5w x 3d inches. 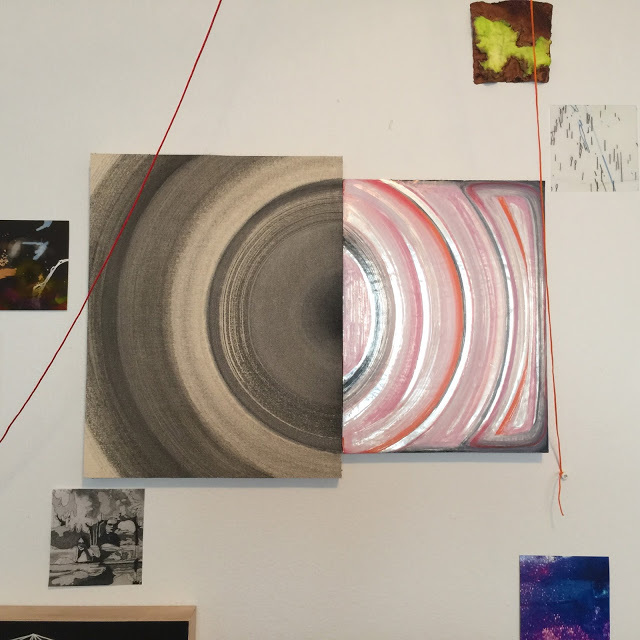 Another thoughtful curatorial effort came from +1=1, a collaboration between Susan Jennings (LabSpace) and Katarina Wong (MADE), featuring an installation in which selected artists chose another artist to pair with his or her work. 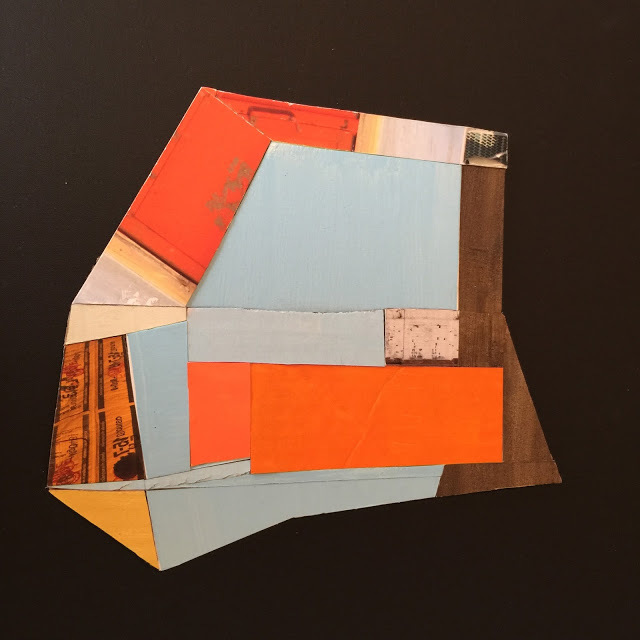 Janice Caswell, Construction 12, 2015, acrylic, ink, collage on cardboard and foam board, 11×8 inches. 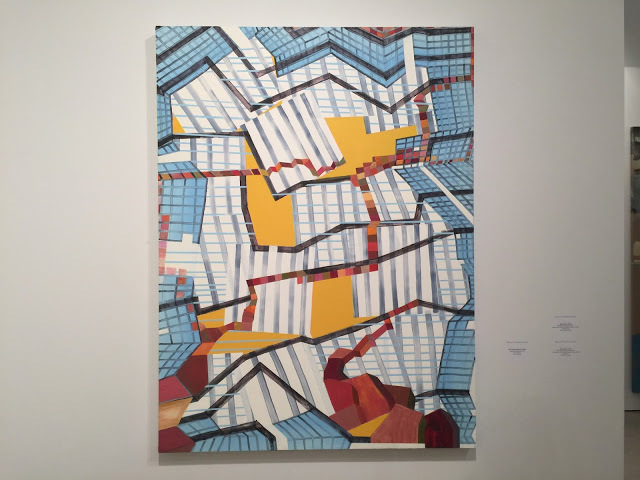 At +1+1: Lisa Beck, Gyre, 2015, acrylic paint on canvas, enamel paint on mylar mounted on panels, 14×20 inches. And finally, looking back through the digital memory, I’d like to post a selection of notable work from other fairs that I didn’t include in previous posts. 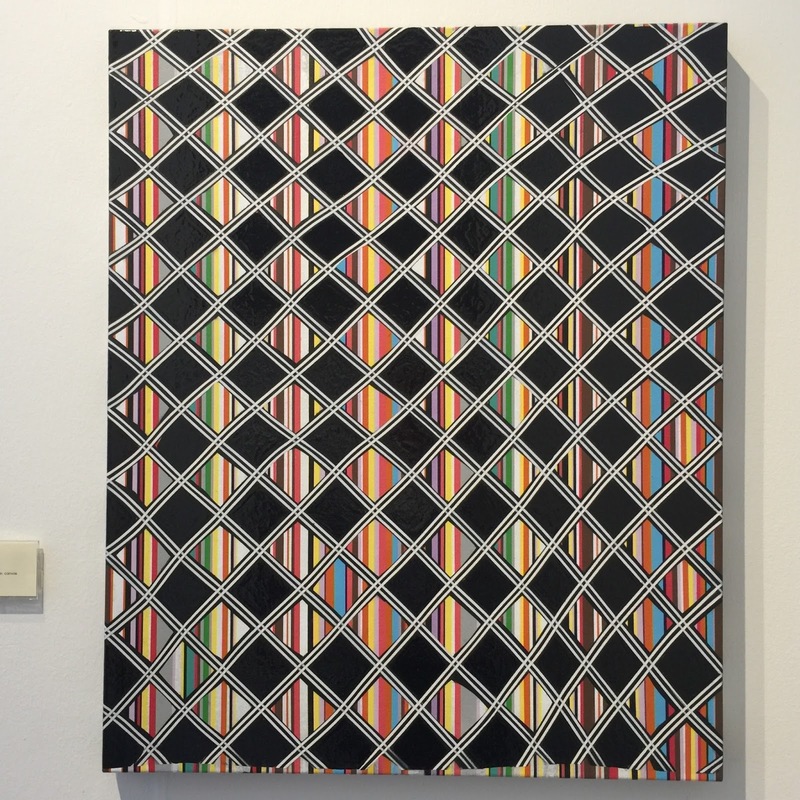 Tim Doud, BKB (Black), 2015, acrylic, enamel on canvas, 34×28 inches at Randall Scott Projects, Miami Project Art Fair. 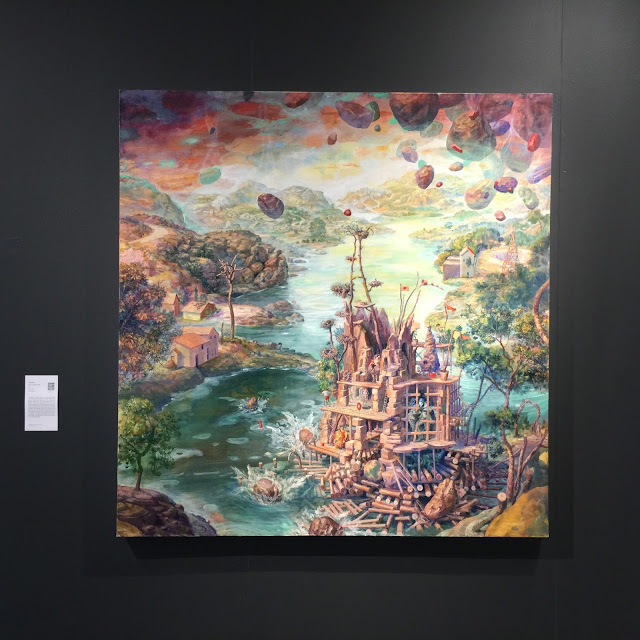 Julie Heffernan, Self-Portrait Between a Rock, 2015, oil on canvas, 68×66 inches at Catharine Clark Gallery, Miami Project Art Fair / Twitter @jheffernan007. 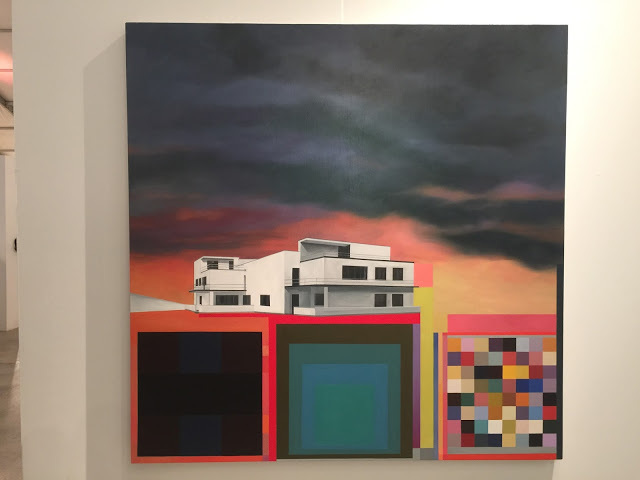 Julie Langsam, Gropius Landscape (Master’s House Kandinsky/Klee), 2015, oil on canvas, 63×63 inches at 532 Gallery Thomas Jaeckel, Context Art Miami. Lisa Corinne Davis, Specious Calculation, 2015, oil on canvas, 60×45 inches at Gerald Peters Gallery, Art Miami Art Fair. 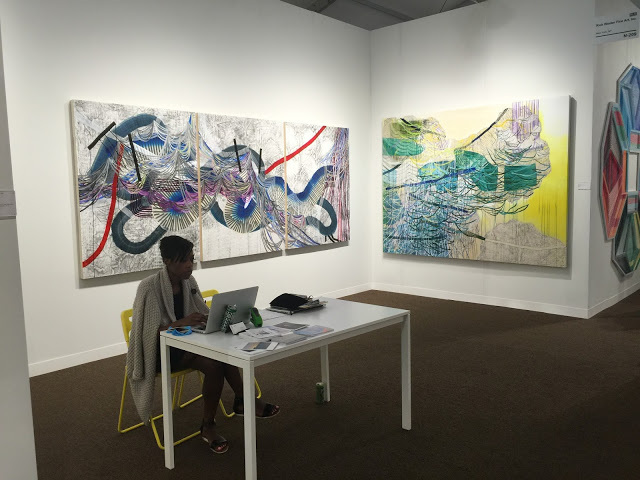 Alyse Rosner, Sweep, 2015, Graphite, fluid acrylic, and ink on yupo 33 x 30 inches at Rick Wester at Pulse Art Fair. 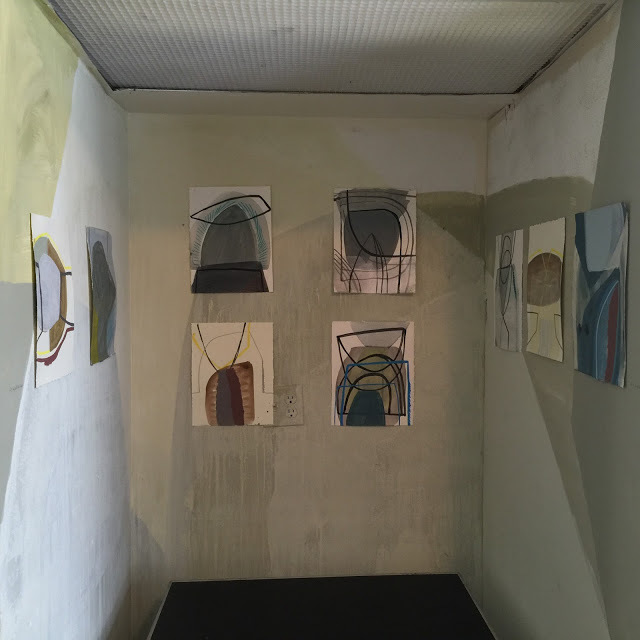 Installation view of Rosner’s work at Pulse. 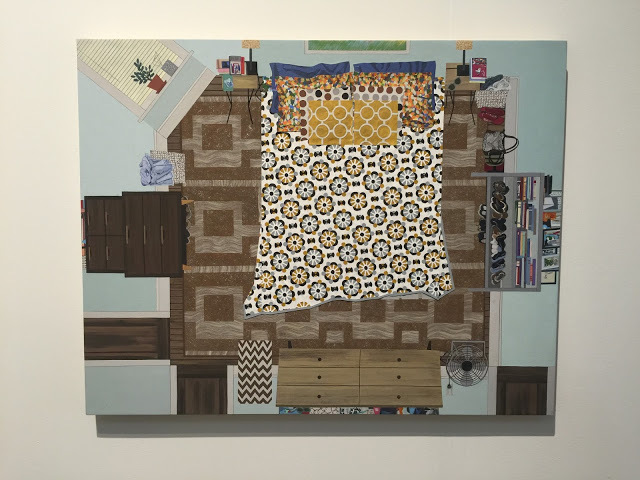 Ann Toebbe, Crooked Bedspread, 2015, gouche, cut paper and graphite on panel, 22×28 inches at Monya Rowe, Pulse. 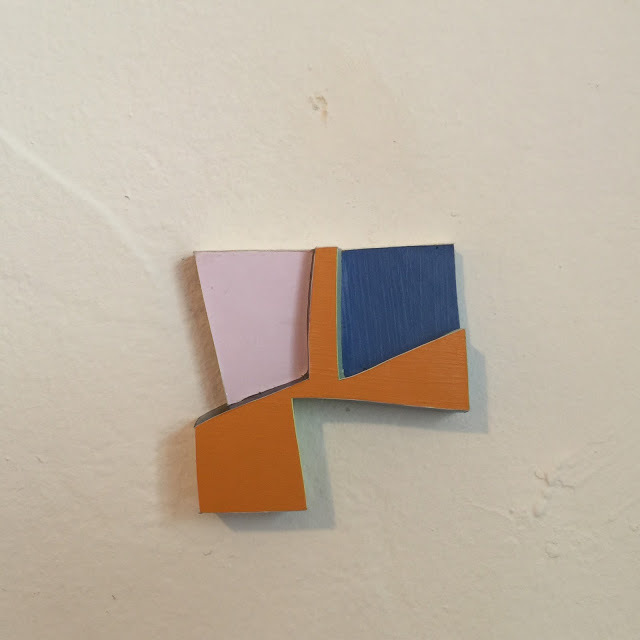 Finally, I leave Miami by sharing a little piece I bought that was made by Katarina Wong. 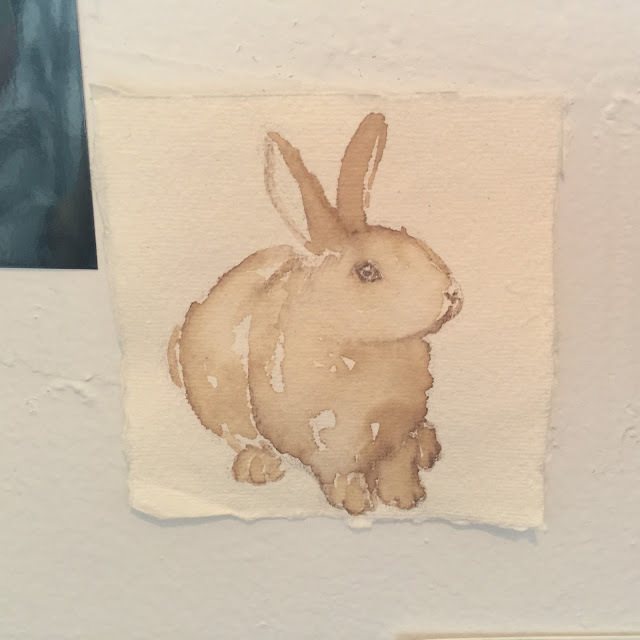 Favorite Things: Rabbit, 2015, coffee on handmade paper, 4×4 inches. 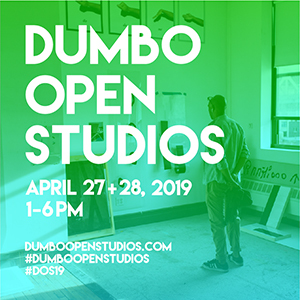 The image reminds me of watching all the bunnies in my back yard in Minneapolis where I’ll soon be thinking of all of the fantastic painting I saw this week. 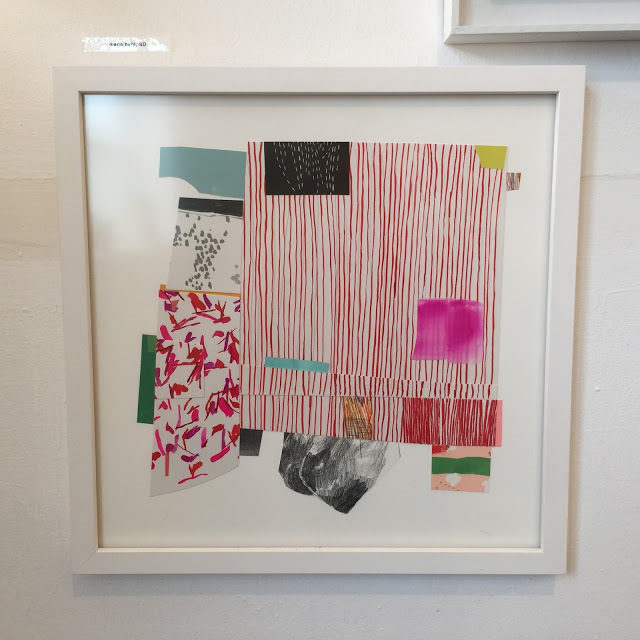 I’m grateful to the amazing and generous Sharon Butler for allowing me to share some work from the fairs and also to all the readers who have followed my posts this past week. Thank you! Editor’s Note: No, Sharon Louden, THANK YOU for doing such an outstanding, indefatigable job! scope of this license, permission is required. Great coverage! 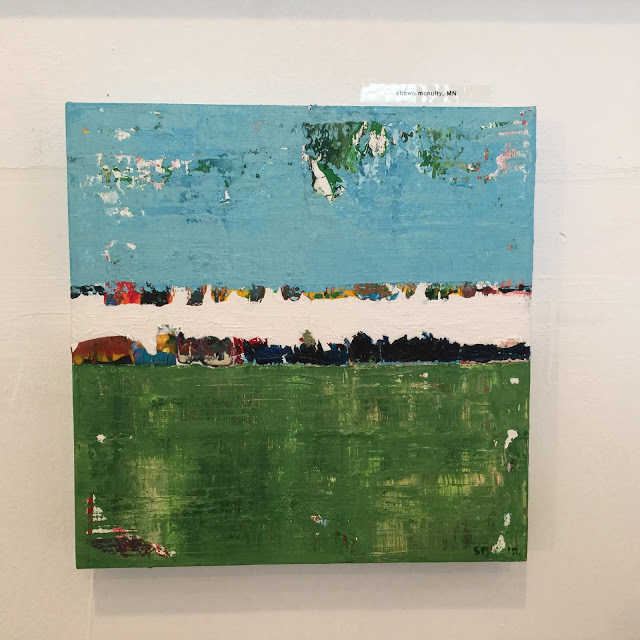 Thanks for checking out 'Art in America' and including so many artists. I loved following your coverage, Sharon. 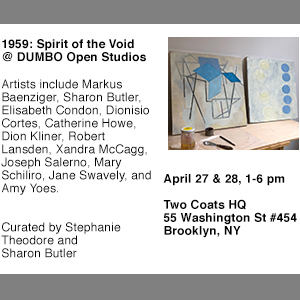 Fresh curation of art viewed.